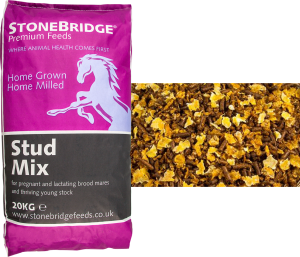 Stonebridge’s Stud mix is a fully balanced muesli especially formulated for pregnant and lactating brood mares, foals and thriving young stock. It is non heating and excellent for maintaining condition. Premium protein is used to support milk production and growth development in foals. This is a complementary feed to be fed in conjunction with suitable forage to ponies or horses. Specially blended for Stonebridge & designed for the health and mobility of the horse or pony, rich in vitamin E & selplex. High levels of Vitamin E, are proven to aid transfer of immunity from mare to foal via colostrums. Containing highly available Bioplex Organic Trace Minerals. A live yeast culture which has been specifically developed in Kentucky for supplementation to horse diets. Yea-Sacc1026enhances fibre digestion and overall utilization of feed ingredients. Mycotoxins are produced by moulds present in feeds and forages. They have been implicated in a variety of acute equine health problems including, abortions and colic. Mycosorb is an all natural detoxifying agent which works in the gut. Palatable and helps bind the vitamins,minerals and spices etc.